Kingsoft Office 2013 is a Microsoft Office compatible free office suite of applications that can be used to create documents, design presentations or make spreadsheets. It comprises of Writer, Spreadsheets and Presentation, all of which have a close resemblance to the familiar layout and functionality users are used to. Due to its user-friendly interface, the office suite can be used by beginners within minutes, as each function is neatly organized and depicted. 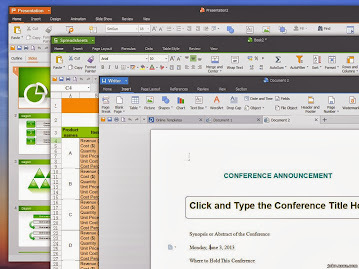 Kingsoft Office 2013 features support multiple tabs thus enabling users to work on several project simultaneously, as well as encryption and spell check. Download free Kingsoft Office Free 2013. Kingsoft Office Free 2013 file size 45.4MB.